Aji tartare at Double Knot. It's hard to know where to even begin with Michael Schulson's latest 13th Street hit, since there's nothing else in Philly quite like Double Knot in terms of a full-drama dining experience. The moody, bi-level Asia-plex is connected to his neighboring Sampan. And there are so many things going on in this all-day venue — serious Elixr coffee (and zucchini bread) in the morning; Viet street-food lunches (great banh mi, noodle bowls, a surprisingly flavorful beef pho); cocktails, a robatayaki grill, and extraordinary sushi at dinner — that trying to untangle them all can tie the mind back up into knots. Holy mackerel knots! 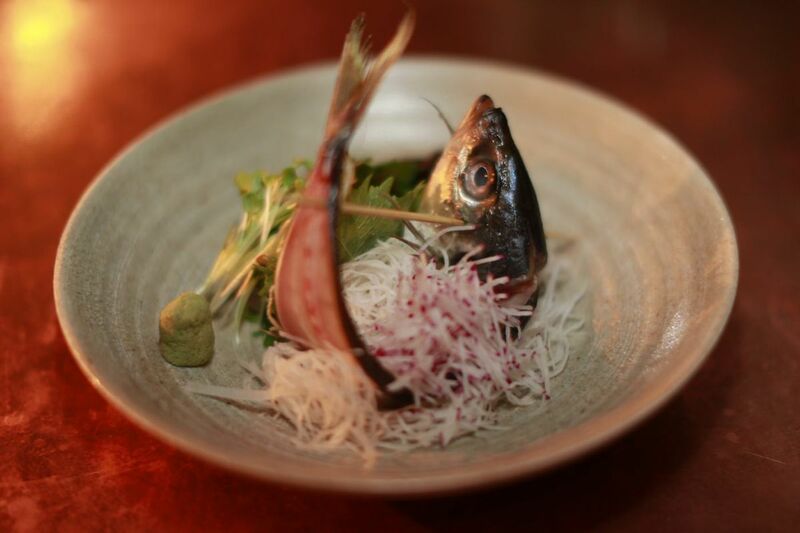 That's what I was thinking when chef Kevin Yanaga's stunning aji tartare arrived, the head-on horse mackerel stripped of its fillets but suspended in mid-leap over a mound of its dusky sweet meat tossed in a citrusy ginger soy. It was especially impressive in the candlelight of the downstairs speakeasy, a transporting hideaway of rooms clad in singed-cedar-plank walls and scrimshawlike murals with vintage nautical fixtures. The elaborate cocktails — smoking table-side or spritzed with yuzu "air" — keep the fashion-forward crowd well-oiled in their knit caps, as does the extensive list of sakes. But Yanaga's food is still Double Knot's most compelling draw. A meal can add up if you roam freestyle à la carte. But the $60 chef's tasting, which delivers 10 little plates (and a dessert), is a deal. Yanaga, a Morimoto and Zama alum who worked at Schulson's Izakaya in Atlantic City, is the first around here to make sushi with warm rice, which boosts natural flavors and textures — the yellowtail as rich as an Omega-3 butter bomb, the live scallop so sweet, a live spot prawn like candy beside its deep-fried head and legs. Japanese uni cradled in nori melted away like cream and surf. Double Knot's menu is far more extensive than sushi, though it has some weak links. As a rule, the more complicated and larger the cooked food, the less I liked it. But there were many small-plate successes: the sake-roasted hamachi collar in miso caramel; a fun pastrami bao bun; stellar Japanese fried chicken; a Wagyu tataki rolled around enoki mushrooms; and a surprising turkey neck scented with smoke from the robatayaki. That slow-roasting charcoal grill coaxes the essence from everything it touches, whether it's skewered coins of tender octopus, a perfect lamb chop, or meltingly soft eggplant glazed in miso. I loved the gamier skewers of venison and buttery Kobe beef. And the seafood skewers of swordfish belly, scallop, and lobster were simple wonders, shined with a yakitori sauce and sparkling with togarashi spice. That is what's most impressive about Double Knot. Despite its dauntingly complex concept and transporting ambience, what dazzles most is the kitchen's talent to let its prime ingredients shine.